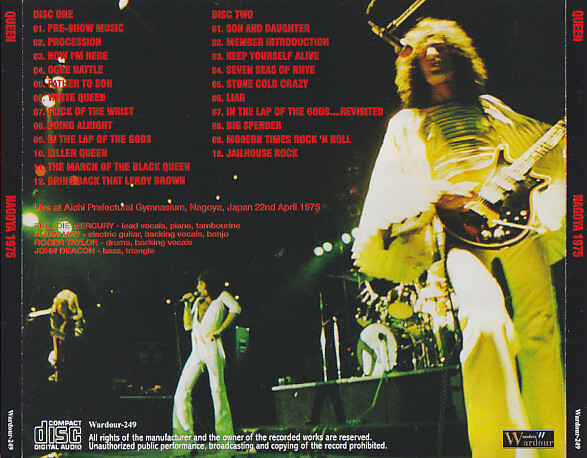 Recorded: Live Aichi Prefectural Gymnasium, Nagoya, Japan on April 22nd, 1975. Comments: New show out for first time on pro-bootleg marked. The first appearance in the world, how “the first visit to Nagoya” is the discovery of a miracle! Yes, this work includes “Aichi Prefectural Gymnasium” on April 22, 1975. 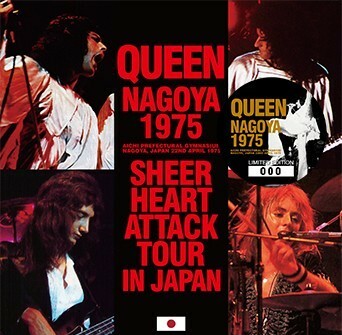 Although QUEEN popularity has been exploding from the first visit to Japan, not all era pattern full performances are revealed. Nagoya performance of this work has only two songs that barely bad recordings were barely recorded, so far the recording was not known. The “Nagoya 1975” which the collectors around the world could not listen even if they wanted to listen to it finally finally becomes clear. Let’s first check the position of the show from the schedule of the first visit to Japan. This is the whole legendary 8 performances. In our shop we have reported on live albums such as “KILLING ME SOFTLY (Wardour – 004)”, “AN EXCEPTIONAL LEGACY (Wardour – 097)” and “FATAL ATTRACTION (Uxbridge 138)”, but the Nagoya performance of this work is It was a concert of the first two performances. This work which contained such an unknown Nagoya performance. Unfortunately, only 2nd encore’s “See What A Fool I’ve Been” and “God Save The Queen” are not included, as the master cassette transferred directly from the recording person himself was made into a CD. However, it will let us experience the whole show of the other shows over 112 minutes. Moreover, its sound is also a wonderful vintage audience. Although it is not a type of “sound board”, it is slightly muzzled to the base, but three people other than the base reach very clearly. Especially great is Freddie Mercury ‘s vocal, clearly up to one of the syllables, not to mention one word of lyrics. A word that I have never heard before can be heard cleanly, ranging from Japanese MC to shout “Konbanwat” “Arigatou!” Somewhat nervous. Besides, that sound is improving. Particularly from the latter half of the show “Keep Yourself Alive” at a stroke is like a different recording! I do not know how the site environment changed, but the bases that had concerns at the beginning were also beautiful enough to be misplaced, each picking up vividly. Of course, the improvement of the sound is in all the sound range, the guitar, the drum and the vocal all become shining sounds. The essence of this work is in “being able to listen to Nagoya for the first time”, but this final section is more than that. Its brilliance, clear air feeling is the best sound that will be the finest in all records of the first visit to Japan. Of course, it did not connect another recording (in the first place, there is no other recording to connect). There is no change in the perspective feeling and the stereoscopic feeling due to the recording position, it is quite seamless. It is like a live album that the heat of the accelerating show has been raised to the sound. It is the balance of great cheers that makes that sound even more vivid. QUEEN The first visit to Japan is not surprising even with a yellow chirpy recording, but there is almost no such audience / noise in this work. Of course, you can see that furious enthusiasm spreads as you get between songs, but the performance / singing voice is much closer and sturdier than its great enthusiasm. Is not it like the first visit to Japan than to the live album so far? It is not said that. Rather, we have vacuum packed the air feeling of the times ultra-realistically, not never before. First of all, the most amazing thing is opening. I recorded the site sound before the performance for 17 minutes. Although I could not wait for the moment of opening I started recording earlier without thinking, but the air being sucked in is also amazing. A huge cheering came when BGM flowing to the hall ended one song, the voice of “Yahoo” “Yoshi, playing!” Flies. However, when the next BGM flows, betraying that expectation, you can hear a conversation saying “It is still long (laugh)”. Among them, the tense feeling rises and the conversation voice also breaks down, and the voice is disturbed, such as “Ooo!” “Encore! Encore!” (Jokes!) “” Early! Investigation of “Procession” to quietly silence that voice ………. Indeed, this is the first visit to Japan. It is not the expectation held by the reputed reputation, it is not the second excitement, but the drama is the perfect score because it is “unknown encounter”. What you do not misunderstand here is that these conversational voices are not being played. As I mentioned earlier, during the concert performance and singing voice dominate so that “audience is far away”. And even at the regular encounter waiting for the conversation, which tends to be the most conversational, the ocean of great crown stirs far away. Correctly “expectation flies, it will not be words”. Such documents are confirmed and clearly recorded. QUEEN who experienced the first great hospitality and Japanese audience who first saw the real thing. QUEEN’s entertainment and crowd enthusiasm are filled with surprises and joy, it is a live & document that is captured wonderfully clearly. This is the Nagoya performance which I had no choice but to imagine from only two songs. Please try and experience the powerful live album released worldwide!